For the first time in many years, Gold Crown will be running weekly tournaments. The competitions will be held every Sunday night with the goal of completing the events by 11:00 PM every week. Special focus is on players getting value for their dollar with a small entry fee and an abundance of play. The game played will be Eight-Ball. 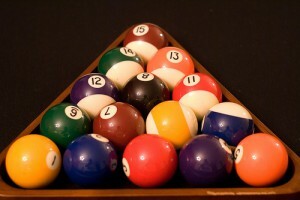 There will also be a Nine-Ball Break-And- Run Jackpot that rolls over from week to week. Each tournament will be a Schofield Event™, a proven popular format. Players get a big play and numerous chances to advance to a championship bracket. In addition, as part of the event, players get an hour of practice time prior to start. Players also receive a card that can be used at any time that entitles them to 5 free rounds of Match-Play or Scored-Play Eight-Ball. The tournament is open to everyone. There is no point spread handicap. These events are singles tournaments but, at the discretion of the tournament director, any player that is classified above “A Division”, will be required to have an approved partner. The partners team will be required to play in the scotch doubles format with no coaching permitted. This method makes it possible for anyone to compete and for anyone to win. If you are looking for a chance to play against different and better players, if you are looking for a chance to gain competitive experience, and if you are looking for organized fun on a pool table, Sunday nights at Gold Crown Billiards could be perfect for you. Come out and give it a try.